SCECH’S CONSERVATION TEAM is broadly the same as it was during our preliminary ocular and technical examination of Yimrihane Kristos in 2012 and will remain so with small changes during the Pilot project of conservation and education here. The choice of team is tailored in order to match the various kind of conservation problems we find within the extensive corpus of cultural heritage sites in Ethiopia, the religious and cultural context – an ancient Oriental Christian Church and tradition – as well as the great need for education in conservation according to the first part of our charter: To work for Conservation in Ethiopia – a Pilot project and the development of a long-term program for conservation and education regarding the care and preservation of ancient religious art and architecture in Ethiopia, with starting points in different professions and in cooperation with The Ethiopian Tewahedo Orthodox Church and institutions and colleagues in Ethiopia. In the photo above, taken in front of the church of Yimrihane Kristos at our preliminary ocular and technical examination of the site 2012, we see from left to right: Professor Karl-Gunnar Olsson, Civil Engineer and Building Expert, Chalmers University of Technology, Lars Gerdmar, Project Manager, Icon Painter/Restorer and independent scholar of Byzantine and Christian Oriental art, Carmen Deas, Painting Restorer, Expert of Byzantine and Occidental wall painting, MA Architect Tadesse Girmay, Expert in architectural drawing and building conservation and Peder Boellingtoft, Painting Restorer, Expert of wall painting, Researcher within the field of multispectral analyze and earlier Head of Department for monumental art at the Royal Danish Academy of Fine Arts, School of Architecture, Design and Conservation. To this picture should be added, Helena Nikkanen (see the image below), chosen to be the Head Restorer for the YK project, Painting Restorer, Expert of Icon Painting on wood, wall and canvas, earlier for many years Lecturer at the Department of Conservation Studies in Helsinki and the Chief Restorer within the Orthodox Church of Finland (see further presentation below). Due to shortage of time Mr Peder Boellingtoft – today working within Nordisk Konservering, one of the leading Scandinavian conservation companies he is the founder of and with international projects – will be engaged on consultative basis and hopefully also as teacher in conservation on workshops planned to take place within the educational part of the project. The team members have more than 25 years of experience within their respective area of field work, teaching and research and master with expertise together all practical and educational skills that is necessary in order to implement the YK Pilot project as well as forthcoming projects of conservation and education in Ethiopia, i.e. architectural conservation, including various fixtures: reparation of plaster damages; wood completions and reparation of damages of architectural wooden details and of fixtures (extensive restoration of built walls and ceilings will be handed over to skilled craftsmen, preferable Ethiopian); conservation of painting on wall, on wood and on canvas (including portable icons on wood and architectural decorative painting, which we find a lots of in the Ethiopian heritage sites); retouching work in different techniques, including tratteggio, done in order to restore larger painting lacunas. To what concerns knowledge transfer of importance to the Ethiopian trainees: conservation methodologies; conservation ethics; multispectral analyze connected to conservation; heritage management and preventive conservation; history of art and architecture and in particularly that which concerns the iconography, aesthetics and the liturgical significance of Orthodox and Christian Oriental art; structural analyze of ancient building technic applied to conservation; history of materials and technics of art and architecture used in ancient buildings and paintings. The spirit of the place – genius loci – is a catchword in SCECH and so also for the conservation team. To pay due respect to the local people and priests who live at and have the responsibility of the heritage site of YK and with them share the reverence and humility to the holiness of the buildings and the art we are privileged to work with is essential. Our Head Restorer, Helena Nikkanen, has during her whole carrier worked within the context of the Orthodox Church. 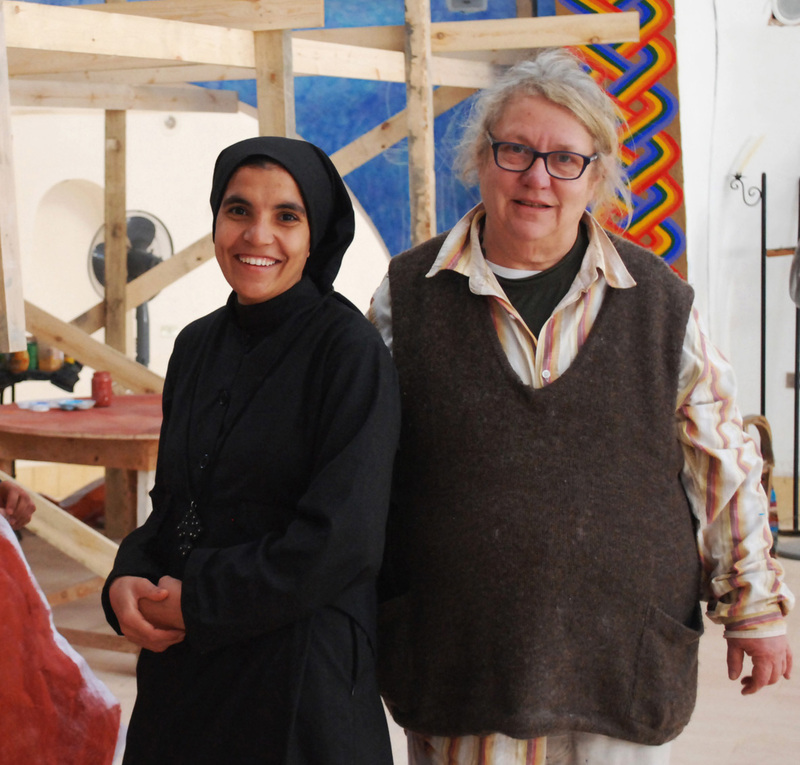 Since a couple of years she is living in Egypt, where she is supervising young Egyptian nuns in Coptic icon painting and work with conservation of Coptic art in the renowned early medieval Orthodox monastery churches in the region of Wadi el Natrun. In the image above we see her during work in progress in the new Coptic church of Anaphora Retreat Farm together with one of the nuns she is teaching in icon painting. To quote Ms. Nikkanen apropos the churches we are going to work with in Ethiopia: it has to be understood that they are churches and remain churches – not museums or exhibitions. So, the hands on work as such and the tools and material we will use at the conservation and in the education in our daily work in YK, will preferable be blessed by the priests so that the project in some how will be part of the spirit of the place. The dialogue with the pious people here about this issue took already place during the days of examination 2012 when our Project Manager, Lars Gerdmar by analogies and symbolism connected to the Bible and the Ethiopian Christian tradition explained the connection between what is done during a conservation in relation to the sacred art and architecture at this place. The intention is that this reverence and this kind of dialogue – important for the people and priests of YK as well as for the conservation team – will continue during the entire project. The plan is to start with the hall of the palace so that the Tabot (the holy object which is placed in all Ethiopian churches and represents the Arch of the Covenant) and the services can be moved and take place here during the very extensive and time consuming conservation of the church and its paintings. The rest of the architectural conservation of this building may – if the local people want to have this restored – take place parallel with the work with the church and its paintings or as the final stage of the project. The painting conservation will be done in several stages with regard to what is practical right and to how the hands on education in detail is going to be accomplished. The assistance of trainees will reduce the expenses for this conservation project largely and the existence of building in acute need of restoration and painting of various kind as well architectural details and fixtures in great need of conservation, make this site ideal for hands on training. To these groups of trainees – all together between 10 and 15 persons – dedicated to become restorers and representing different parts of the country will be invited to attend the different stages of the project and this in interaction with the graduate education will so become the first stage in a national program of education in conservation, with the objective to create a domestic profession of restorers. 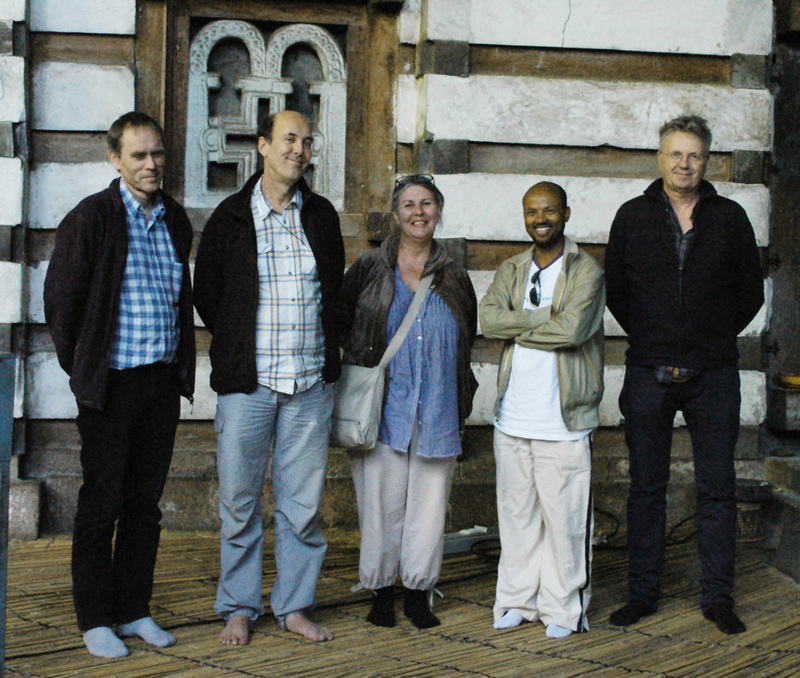 A graduate education in conservation and heritage management – to which this hands on training at YK could belong – will take place in Lalibela as a branch of Weldiya University. It will be opened in Lalibela in October this year and curriculum for this education and the one at Yimrihane Kristos during ongoing conservation could be interrelated. A more detailed plan of this with regard to practical arrangement and time schedule can only be settled down after finalized estimation of time needed for the conservation, discussions between SCECH and mentioned conservation institute in Lalibela, and first and foremost after a close dialogue with representatives for the local councils and people of Yimrihane Kristos. 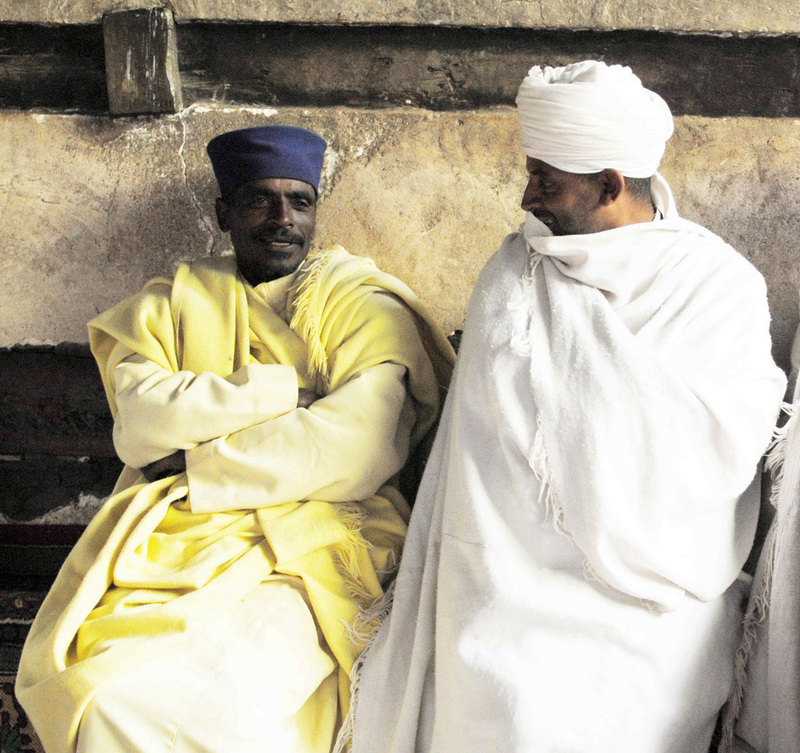 In the image above we see to the left the charming Abba Welde Qirqos, Head priest in Yimrihane Kristos in discussion with one of the members of the communal council. In August/September a delegation of five key figures of the local group in Lasta, including one person from Yimrihane Kristos will visit us here in Sweden. They will come in order to learn from how we are working with conservation here and from ongoing projects. We will then have ample time to discuss the details in a plan for the Yimrihane Kristos Pilot project, as well as the future of this site after finalized conservation.